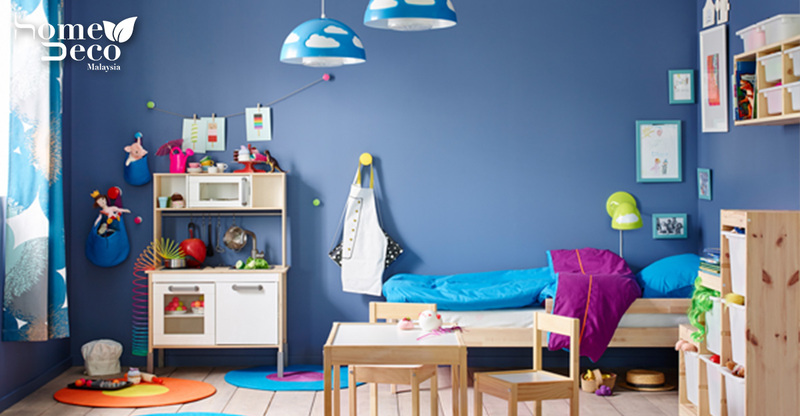 We’ve made the adult space look good but don’t forget the children spaces! Their needs are different from adults and that is what makes decorating for the younger ones a little more fun and pushes your creativity. A common issue in a household with kids is trying to keep an organized and uncluttered home. Keeping the house organized with children can be a challenge so here are some ideas to make it easier and enjoyable for the family. If you’re tired of screaming at kids to pick up their toys, have a look at the placement of the storage boxes. Having storage as part of the play area makes it easier to clean-up. A way to do it is to provide racks in their play kitchen. It also functions as a display for pretend food. Another option is to make your own play table because it keeps toys contained around the small area. Stack storage boxes under the table and you already have a space-saving play table. Keeping small items such as toys in clear boxes help to identify the toys easier. If labelled, it makes cleaning up organized and less of a hassle. Books of different sizes and shapes can look messy and it doesn’t help if the child’s room is small. To help manage this issue, install some shelves or floating frames to hold the books. If possible, keep them at child’s height so they can read whenever they want to instead of waiting for an adult to help them reach it. To make the corner prettier, arrange the books by colour. It’ll look like a rainbow in the room. If getting kids dressed take time, try labelling drawers so you’ll know where items such as socks are stored. Planning their outfit the night before together with them also cuts down the hassle and rush in the morning. Under-bed drawers not only maximises space but keep stored items out of sight! It’s a multipurpose storage solution and can be used to store children’s belongings. If your kids love playing dress-up, having a rack is a nifty space saving solution. Remember to keep the racks at child’s height. If there’s wall space, a peg rack works similarly. Ashley of Bigger Than the Three of Us transformed her son’s closet into a space that’s part reading nook and part storage space. This works well because children love hiding spots to play in. Imagine all the make-believe play that could take place here. It looks like a good place for a nap too!